What do you write down? For most of us, writing consists of emails, task lists, and perhaps the odd work project. However, making time to write down certain things, such as our daily experiences, our goals, and our mental clutter can change the way we live our lives. Here are six different ways that writing things down can change your life, and what you can do to get the most out of each. 1. It clears your mind for higher-level thinking. You can clear your mind by writing things down in two different ways. David Allen, productivity speaker and author of Getting Things Done, recommends doing what he calls a “core dump”. This involves writing down every task, activity, and project you need to address. This could range from picking up milk on the way home, to a multi-person project at work. Writing down every “to-do” item you can think of clears space in your head for more important topics. You can also use a technique called “morning pages”, which was pioneered by Julia Cameron, author of The Artist’s Way. Morning pages involves completing three pages (around 750 words) of stream-of-consciousness writing. Through doing this first thing each morning, you clear your head in preparation for the day’s most important thinking. 2. It helps you process your emotions. Writing down what’s on our mind is a great way to work through inner conflict or process your feelings around a particular situation. It’s similar to talking a situation through with a friend, except it’s a useful way of strengthening your self-soothing abilities and enhancing your self-knowledge. 3. It gives you a record of the past. If you keep a journal and regularly write down your thoughts and feelings, you’ll soon have a record of your experiences that you might otherwise have forgotten. Reading back through this record is not just fascinating—it also provides a valuable insight into your thought process and emotional life. You can savor moments that you could have potentially forgotten and increase your levels of gratitude. Keeping a journal can also enhance your levels of self-trust. When you can look back and see how successfully you’ve traversed and dealt with important decisions and tricky situations in the past, you’ll feel more confident in your ability to do so in the future. 4. You gain a sense of achievement. Writing things down can foster a sense of achievement and progress, expanding our possibilities and increasing our productivity. If we journal, it’s incredibly satisfying to fill up one or more journals with our thoughts and feelings. Many people harbor dreams of writing a book, but balk at the reality of how long it takes. When you finish a journal, you’ll realize that you have written a book. This opens up a new sense of possibilities, not just in writing but in other areas of our lives, too. Equally, if we write down everything we need to do in a particular day or week, we gain an additional sense of satisfaction when, having completed the task, we can cross the item off our list. Feeling productive enhances our productivity, creating a virtuous cycle. 5. It helps you think big. Writing things down gives you space to think big and aim high. No matter what’s going on in our outside world, when we write things down, we enter a world of possibility. When we write things down, we have a chance to explore dreams and ambitions that we might not feel safe revealing to anyone else yet. We also have a space to keep track of all our ideas and desires so we can return to them later. 6. It makes you more committed. As well as offering a space for exploring possibilities, writing our goals and ambitions down makes it more likely that we’ll achieve them. As with any goals, they are most effective if they are SMART: specific, measurable, actionable, realistic, and timed. These are all variables we can work out and commit to through writing. Writing down our goals is the first step towards making them a reality. It can also help us stay accountable. When you’ve outlined your SMART goal in writing, display it somewhere you can see for an extra shot of motivation. The first definitive confirmation of the Mers coronavirus in the camel provides a “missing link” for disease experts, said Henry L. Niman, a microbiologist in Pittsburgh who tracks the Middle East virus and other infectious diseases. Mers typically causes severe respiratory problems. The virus typically spreads in limited fashion from person to person after appearing in a community, but medical experts have been mystified as to the original source animal. Owning racing stables or farms with camels and other livestock is popular among Saudi and other Gulf residents with the means to do so. Some, but not all, of the originating human cases in clusters of Mers have been found to have come in contact with camels or other livestock. But the reality too is that if you walk past the endless rows of vegetables, past the dozens of stalls selling every possible part of animals in any market around the world, scores of people are selling and butchering live animals, breathing the same air and in constant contact with the animals’ blood, urine and faeces. Of the roughly 400 emerging infectious diseases that have been identified since 1940, more than 60 per cent are zoonotic — they came from animals. Throughout history this has been common. HIV originated in monkeys, ebola in bats, influenza in pigs and birds. The rate at which new pathogens are emerging is on the rise, even taking into account the increase in awareness and surveillance. Which pathogens will cross the species barrier next, and which one is the greatest potential public health concern, is a subject of intense interest. A modern outbreak, caused by a previously unknown virus, could travel at jet-speed around the world, spreading across the continents in just a few days, causing illness, panic and death. day.” He said, “We are closer to Moosa than you.” So he fasted on this day and told the people to fast. Coming across so many messages heralding the start of a new Muslim Hijrah year evoked a mixture of feelings. On one hand, it feels great to know that more people are becoming aware of their deen. On the other, it feels sad that the hype is for all except the real lessons behind the Hijrah. It is imperative to first find out about the basis of any issue regarding the religion before spreading it among the people. The sources i.e.the Qur’an and the Books of Hadith are widely available. Let’s research them more. The Hijrah symbolizes a pivotal period in Muslim history. The persecution of the early Muslims in Makkah was so awful that Allah(SWT) commanded the Prophet(SAW) to migrate to Madinah (the literal meaning of Hijrah is migration) along with the Muslims. They migrated at different times for they were a people of different means. Many of them left family and property behind venturing into a new life full of unknowns. Such was the unwavering faith they had. The Prophet (SAW) and Abu Bakr particularly had a rough journey. To escape from the Quraish(powerful tribe in Makkah) they stayed in a cave along the way for days and came close to being found out. Ali(the Prophet’s cousin), Asma(Abu Bakr’s daughter) and the rest of both their families played major roles in their migration. In the end, the Muslims found a refuge in Madinah and flourished there. Perseverance: the Muslims bore the persecution. They experienced hunger and threats to their lives. They an economic embargo placed on them. It was a really difficult time. Sacrifice: they left their families, property and all the things they had loved all their lives for the sake of Islam. Patience: the Makkans were patient all through the persecution. They did not leave until they were commanded by their leader, Prophet Muhammad(SAW). He also waited for the command from His Lord. Acceptance: The people of Yathrib(Madinah) welcomed the Makkans(Al Muhajirun: the immigrants) wholeheartedly. They were thenceforth known as Al Ansar(the Helpers). Food,clothing, wealth,homes were all shared. It’s the one thousand, four hundred and thirty-fifth year since…Allahu Akbar. What does the Hijrah mean to you? From literature books where they were a cause of much consternation to our ancestors to elementary science where they were illustrated with diagrams of the sun, moon and the earth; eclipses have always been phenomena of amazement. Till today I still find them awe-inspiring. The last one I saw was in 2006. I remember it was a big day in school where everyone viewed it as reflections in large basins of water placed on the assembly ground for that purpose. It was beautiful and special. Today, much the wonder remains the same. It doesn’t matter to me whether it’s solar,lunar,total or partial. At first, it didn’t seem like it was going to happen. I mean who isn’t tired of Nigerian BBM broadcasts and their propensity to contain rumours already? I got a lot of messages saying to avoid superstition and pray instead. Suddenly, I got a picture thrust in my face. The eclipse! Taken right where I was! 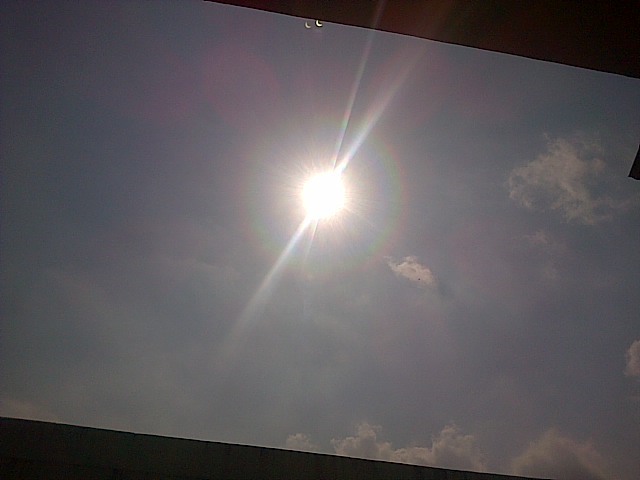 Excited, I ran outside and marvelled at the beauty of Allah’s Creation. Everyone around came out and took pictures. It felt really great. Even more amazing is what I have learnt today about eclipses. I would love to share it with you. During the lifetime of the Prophet Muhammad (peace be upon him), there was a solar eclipse on the day that his son Ibrahim died. Some superstitious people said that the sun eclipsed because of the young child’s death and the Prophet’s sadness on that day. The Prophet corrected their understanding. Please follow the links below to learn how to pray this salah. Lets revive a sunnah in our community and enlighten those who are not aware. How to pray Salaat al-Kusoof (prayer when there is an eclipse)? P.S If you are living among Yoruba-speaking people, do not be surprised to be greeted or visited, “Eku eclipsi yii”. They have a special greeting for everything and everybody!